Pangram puzzles are a simple crossword variant, although they are not normally announced as such - it is often up to the solver to realise that they are solving a pangram. So what is a pangram puzzle? 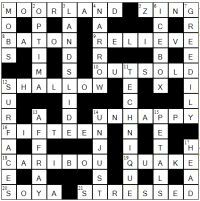 It is a crossword with a particular interesting property - it uses every letter of the alphabet from A - Z at least once. Spotting that a puzzle is probably a pangram can help with solving it, as it means you can be on the lookout for less common letters such as Z, Q and J to appear in the puzzle - and of course if you have one or two answers left and a letter that you haven't used yet, then you'll know that it must appear in the remaining answer or answers. Our pangram crosswords, therefore, are puzzles that use every letter of the alphabet at least once. As illustrated above, this can be used to help you solve the puzzles. In all other respects, pangram crosswords function the same as normal puzzles. That's why, when they are not announced as such, many people don't actually notice when they solve a crossword that is also a pangram. For standard UK style quick crosswords, it is not particularly common for a puzzle to also be a pangram by chance, probably in the region of 1 in 250 or so puzzles will be - clearly the more squares in the grid / the larger the grid, then it is more likely as there are more opportunities for each letter to appear in the grid. Pangrams therefore that do appear unannounced are normally by the specific design of the creator of the puzzle, and this means that they often appear in hand-crafted puzzles and they are reasonably common amongst cryptic crosswords - if you see someone comment on a cryptic puzzle that it is also a pangram, they simply mean that it contains every letter of the alphabet at least once, a property of course that is shared with codeword puzzles. We hope you enjoy solving our pangram puzzles, and the subtle but interesting extra solving logic afforded by the knowledge that every letter appears in the solution grid.